This 72nd Independence Day celebrate the feeling of freedom by getting the best electronics at the best price possible. We have aggregated all the electronic sales that will be live during the period so avail the discounts. If you’ve been planning to buy any electronic product then your wait is finally over. There is no why to it because all the big e-commerce sites are ready to serve you with the biggest discounts possible. Although, Figuring out all the sales during the festive season could be a daunting task but hassle not because we are adamant on sorting you out. This Independence Day avail the benefits of discounts upto 75% off and more on certain categories. The biggies are not leaving any stone unturned and are offering discounts in all categories be it a Smart TV or a mere Pendrive. Also, the brands offered are best in the market from Samsung to voltas everything will be on sale from today onwards on these websites for a period of time. Therefore, avail the great benefit of Independence Day Sale and save that hard earned money in your pocket. Amazon is among the biggies in our country if we collectively aggregate all the big e-commerce electronic stores. It has a wide range of consumers and a wider range of products to cater them. This Independence if you’re planning to purchase any electronic product be it a Smartphone or Laptop or something as small as a pen drive, Amazon Electronics Sale 2018 has the right deals for you. 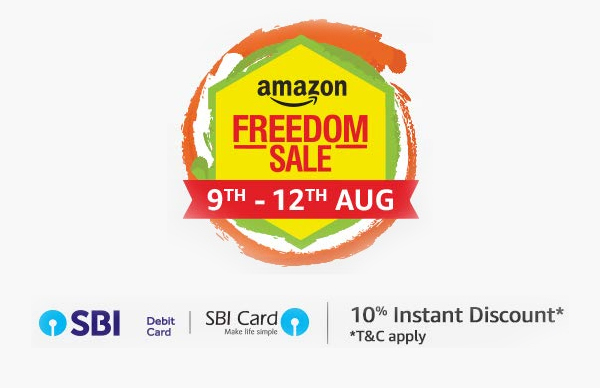 Amazon Freedom Sale Date: The Amazon Freedom Sale will be running from 9th August 2018 to 12th August 2018. Electronics: Get a discount of upto 50% on electronics on Amazon this Independence Day. Amazon is offering great discount on electronics products such as DSLRs, Portable Speakers, Pendrives, MicroSD Cards, LED Television and much more. All these electronic devices are being offered from all the top and famous brands like Strontium, JBL, Canon, Samsung etc. So be sure to check them out if you have any plans to buy them this Independence Day 2018. Click here for offers. Mobile & Accessories: Mobile and Accessories will be sold at a discount of up to 40% off. All your favorite smartphones will be getting a revamp on prices during the time of sale so check out the offer page here. TV & Appliances: A discount of upto 40% off on TV & Appliances. Don’t ask what you’re getting, just ask what am I not because they are offering Chimneys, Smart TVs, Refrigerators, Washing Machines, Air Conditioners, Microwaves, Dishwashers, and Home Entertainment Systems. The brands you will be getting are as follows Samsung, Sony, Haier, Whirlpool, Bosch, Voltas etc with great discounts of upto 50% off. Click here for the Offer Page. Home & Kitchen: You’re getting a discount of up to 70% on Home & Kitchen Appliances and Essential. The discounts offered are on products like Cookware, Induction Cookers, Water purifier, Iron etc. all from the most famous top brands like WonderChef, Milton, Prestige, Space Wood etc. Click here for the offer Page. SBI: Get an additional discount of 10% on purchase using the SBI Credit/Debit Card. No Cost EMI: Pay easy installments without paying the interest. Free Shipping: Use your prime account and get all your deliveries fast and free. It will be unjust to mention Amazon but not talk about Flipkart’s Electronic Store. Why? Well, tell me which one among them is number one in our country, confused that’s why. This Independence Day Flipkart has a great Sale on Electronics Products. The Electronic store is offering some of the best deals and discounts offered till date. The discounts offered are upto 80% on certain products and much more. Flipkart Big Freedom Sale Date: The Flipkart Big Freedom Sale will be running from 10th August 2018 to 12th August 2018. Mobile: Get deals on all your favorite mobile devices like Redmi Note 5 Pro, iPhone SE, Asus Zenfone Max Pro M1, Honor 9 Lite, and many more. All these Bestsellers will be available at greatly discounted prices. Also, there will be a range of new launches like LG Q7+ Thinq, Infinix Smart 2, Samsung Galaxy On8 and many more all offered at great prices. Click here for the offer page. TVs and Home Appliances: Get a huge range of range of appliances with discounts upto 70% off on Electronic Sale. This Flipkart Electronic Sale 2018 offers you products in categories like Smart TVs, Juicer Mixer Grinders, Washing Machines, Microwave, Refrigerators. The products offered are from the top brands with a lot of discounted prices that will be revealed during the sale. Click here for the Offer Page. Laptops, Cameras, Audio, and More: Flipkart sale also has discounted price of upto 80% Off on these Electronics Products. The range offers all the top brands like Mi, Honor, Google, Apple etc. Click here for the offer page. CitiBank: Get an additional discount of 10% on purchase of products using the CitiBank Credit/Debit Card. Other Sale: There will be other sales on Flipkart like BlockBuster, Rush Hour, Premium Electronics that are active now and will be activated during the sale time. Snapdeal is another great store that is having a wide range Independence Day Offers on electronics. The store has a variety of product and is a big name in the industry. They are offering discounts upto 75% on the best electronics available. The company has been there for a long time and is a common name when it comes to online e-commerce stores. Snapdeal Deal of India Sale Date: The Snapdeal sale will be starting from 10th August 2018 and will run till 15th August 2018. Certified Used Iphone: Get a discount of up to 60% on your favorite device by Apple. Snapdeal is selling used iPhone certified by them for superior quality at a discounted of as much as 60% off. Also, they are offering a warranty of 6 months. Electronics and Much More: The products being offered in the sale have discounts as high as 79% off. The range of products includes Speakers, printers, portable speakers, trimmers, Laminators, Vacuum Cleaners etc. all from great and dependable brands. HDFC: Get discounts of up to 10% along with 5% cashback on credit card and 5x rewards on credit cards. For all those who have purchased from Tatacliq knows that they offer some of the best deals and offers on electronics especially. This independence day they are following the same path traveled before and giving discounts upto 70% in their electronic sale. The discounts offered are divided into two categories mainly: Electronics and Home Appliances. Tatacliq Electronic Sale Date: The Electronic sale on Tatacliq will be running from 9th August 2018 to 14th August 2018. Electronics: Tatacliq is offering a discount of up to 75% off on certain products. The e-commerce site has a whole range of electronic products that are being offered like laptops, cameras, headphones, printers, power banks etc. All these products will be offered by all the best brands so have no doubt because Tatacliq will sort all your electronics need. Home Appliances: You will also be getting discounts of up to 60% on all your favorite home appliances. The home appliances being offered are Washing Machine, Air Conditioners, LED TVs, Mixer Grinders etc. The king of cashback is back again and isn’t falling short in its USP, Cashbacks. Paytmmall is a subsidiary of Paytm that caters to its consumers as an online store for everything, yes because they deliver grocery also. This time on independence day they have planned great cashbacks in their Electronics Sale Online. Therefore without wasting any time let’s stroll on to the offers that are mentioned below. Paytm Independence Day Electronic Sale Date: The sale on Paytmmall will be active from the 8th of August 2018 to 15th of August 2018. Lap-Zap: Get a cashback of upto Rs.20000 on the purchase of laptops. Also get a wide range of accessories related to it with great cashback offers. The cashback is available on all the top brands of laptops like Asus, Lenovo, HP, Dell etc. Also, the range of accessories involves everything like Headphones, Power banks, Pendrives etc. Smartphones: Get a cashback of upto Rs.10000 on all the best brands such as Apple, Samsung, Nokia, Motorola etc. No Cost EMI: Purchase anything you want and avail the option of easy installments without paying for the interest. Exchange Offers: Get a cashback of as much as flat 18% cashback on the smartphones.